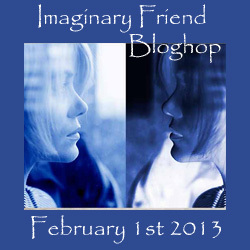 The Imaginary Friend Bloghop is being hosted by Analisa and Kyra. Old follower---I'd like to wake up in HP world, but I'd be scared to death to do so! I have a lot of fun playing with the mouse on your blog. Thanks for being a part of the bloghop! Oh dear. He was a rascal. :) Have a great weekend! Oh how bad! I once fed the neighbor girl a mud pie...but it was all me...no imaginary friend to blame it on! Funny, I adored Ronald MacDonald too, and yet now I think he looks a bit creepy. I didn't have an imaginary friend. I was my older sister's shadow. Didn't need one.